Philadelphia Fire Department crews rescue construction work from hole on Market Street in Old City on January 9, 2016. 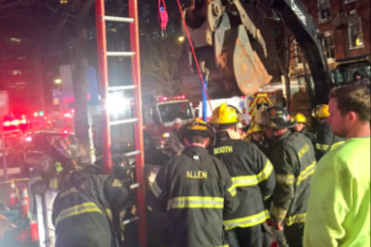 A construction worker who fell into a roadway hole in Old City Saturday afternoon was rescued after Philadelphia Fire Department crews responded to a collapsed section of the street. According to officials, the incident occurred around 3:15 p.m. between the 300-400 blocks of Market Street, 6 ABC reports. The victim, who has not been identified, was reportedly part of a City Plumbing construction crew on site to install an underground sewage line, according to NBC 10. When a part of the street apparently collapsed, the worker's foot and leg became wedged in by the rubble. After a two-hour rescue effort, the fire department crew was able to successfully extract the victim from the hole. He was then taken to Jefferson University Hospital, where his condition was not revealed, though a witness confirmed he was conscious and talking at the scene. SEPTA's Market-Frankford line was briefly suspended due to underground vibrations during the rescue effort. The transportation agency provided shuttles between 2nd and 5th streets. While the preliminary cause of the incident is believed to be a caved-in street, officials plan to conduct an investigation to determine exactly what happened.